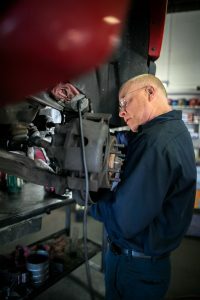 Brakes are one thing that most drivers take for granted as they are more concerned with how fast their car, truck or SUV can go but without your braking system it would be impossible to safely operate your vehicle. Let us check your brakes and we can give you an estimated time frame or mileage window as to when you can expect to have them replaced. No matter the make or model of your vehicle, your braking system is the one the best safety features it has to offer. It allows you to avoid road hazards as well obey even the most basic traffic laws. Not sure if you need a brake inspection? Well there will be some early warning signs as to when you should have your brakes inspected and possibly changed. One of the most common signs that you may need to have your brake pads changed soon is a high pitched squeak or squeal when engaging your braking system. This is because some brake pads have a metal filament embedded in the pad itself. When this filament is exposed it creates the unpleasant sound letting you know that your brake pads are getting low. Not to worry, your brake pads are meant to wear down over time because they help prevent metal on metal contact. Without your brake pads your braking system would create a lot of friction and heat. Heat is most often your vehicle’s worst nightmare as it can cause parts to warp and prematurely fail. Let us know if it has been awhile since you’ve had your brakes inspected and we can quickly check your brake pads and give you a good idea of how many miles they have left in them. The fluid in your brake lines is what allows your brakes to function properly. Without it you could not engage your brakes simply by depressing your brake pedal. It is a good idea to have this fluid checked every so often especially as your car, truck or SUV gets on in years because when it gets contaminated, your brake fluid can become acidic. This acidity will eat away at the vulnerable components of your braking system which can lead to a more involved repair later down the road. So if you have questions about how to best maintain your brakes, give us a call, drive on into our shop or feel free to schedule an appointment online for a day and time that works best for you and we will be happy to assist you with all your brake related needs!